[fusion_builder_container hundred_percent=”yes” overflow=”visible”][fusion_builder_row][fusion_builder_column type=”1_1″ last=”yes” spacing=”yes” center_content=”no” hide_on_mobile=”no” background_color=”” background_image=”” background_repeat=”no-repeat” background_position=”left top” hover_type=”none” link=”” border_position=”all” border_size=”0px” border_color=”” border_style=”” padding=”” margin_top=”” margin_bottom=”” animation_type=”” animation_direction=”” animation_speed=”0.1″ animation_offset=”” class=”” id=””][fusion_title size=”2″ content_align=”left” style_type=”default” sep_color=”” margin_top=”” margin_bottom=”” class=”” id=””]New Philips Portable Bluetooth Speaker BT2600 Delivers Powerful Sound Wherever You Are[/fusion_title][fusion_text]Petaling Jaya, July 4, 2016 – Gibson Innovations presents the latest range of portable Philips Bluetooth speaker BT2600, offering wireless high quality music playback while on the move in a style to suit everyone. This easy-to-carry, compact and rechargeable speaker delivers a clean and powerful sound experience that you would not expect from a small speaker. 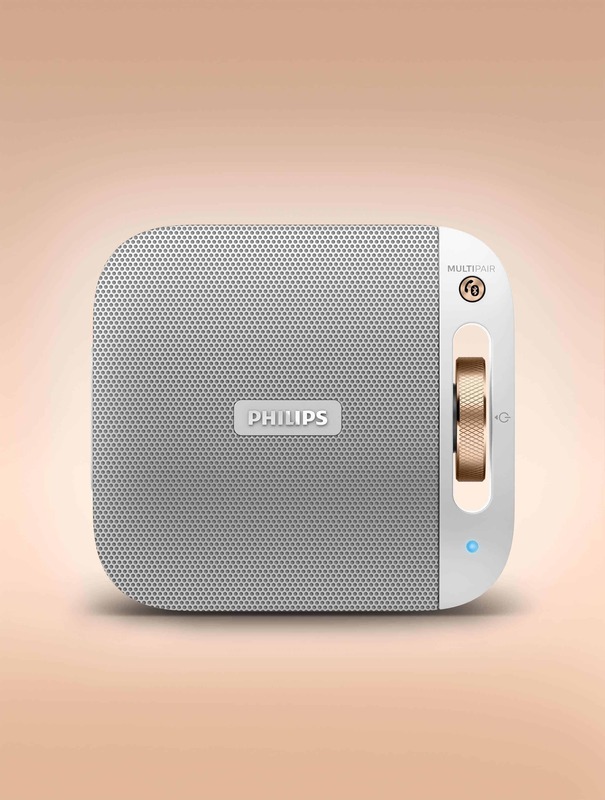 Available in a variety of colors, the Philips BT2600 features multi-pair technology, allowing you to connect to two smart devices at the same time simply by touching your smartphone or tablet on the speaker. It’s perfect for sharing music with friends, at parties, or just playing different songs stored on different devices. The Philips BT2600 offers complete flexibility as these slim and 0.21kg lightweight designed speakers can be easily carried and placed anywhere. With its built-in rechargeable battery, the speaker allows you to enjoy your music for 8 hours long without the fuss of tangled power cords ant the inconvenient search for an electrical socket. The Philips BT2600’s Anti-Clipping allows you to play music louder and keeps the quality high, even when the battery is low. The speaker accepts input signals from 300mV to 1,000mV and keeps your speakers safe from damage by distortion. For those who enjoy a life of business and pleasure, the Philips BT2600 also features a built-in microphone for hands free calls. “This convenient and versatile speaker allows you to play your music wherever you want, offering great quality sound that doesn’t distort and a long battery life,” said Mr. Andrew Tan, Business Leader, Gibson Innovations Malaysia. “By being able to share music amongst your friends through multi-pair, these extremely portable and durable speakers really are the perfect companion for those constantly on the go,” added Mr. Tan. From great sound quality, to advanced technology and sophisticated design, Gibson Innovations strives to improve the entertainment experience. Headquartered in Hong Kong and with over 2,000 employees worldwide, we develop and market products in sound, home entertainment and related accessories. Gibson Innovations is a Gibson Brands company and a brand licensee of Royal Philips.